"For it is by grace you have been saved, through faith." Ephesians 2:8 This Scripture verse reminds all of us that it’s through God’s grace that we have been redeemed and it’s Christ alone who sustains everything. This beautifully designed water bottle perfectly displays this verse through a classy, subtle print of the scripture on the backside of the bottle. 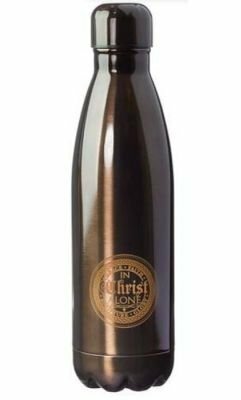 The front side of the bottle has a gold circular medallion which reiterates the scripture from Ephesians 2:8.